Many complex systems, such as military vehicles and mining equipment, are repairable. For repairable systems, the number of failures at a given operation period is one of the most important reliability metrics. Based on the predicted number of failures, proper resources can be allocated. ReliaSoft’s RGA (reliability growth analysis) software package provides tools for repairable system modeling and prediction. In this article, we will explain how to predict the number of failures, with confidence bounds, for repairable systems. where λ(t) is the ROCOF at time t, and β and λ are the model parameters. Please note that Eqns. (2) and (3) calculate the expected number of failures, while Eqn. (4) calculates the probability of obtaining i failures for a Poisson process with parameter of (E(N(Δt)). The "expected number of failures" and the "number of failures" are different-- the "number of failures" value is derived from a Poisson process that uses the "expected number of failures" value as a parameter. Once we have failure data, the model parameters and their variance can be estimated using maximum likelihood estimation (MLE). For details, please refer to the Reliability Basics article in last month's issue of HotWire. In this article, we will focus on calculating the confidence bounds for the number of failures and for the expected number of failures. An example is used to illustrate the calculations. The following figure shows failure data for a repairable system. The estimated β = 1.3009 and λ = 0.0052. The variance and covariance matrix for these two parameters can be obtained from a general spreadsheet, as shown next. Using the calculated results from RGA, we can calculate the bounds for the expected number of failures. Based on these calculated bounds, which are then used as the parameter for the Poisson distribution, we can further calculate the confidence bounds for the number of failures. These calculations are not available in RGA; all of the calculations are done in Excel®. Assume we want to calculate the expected number of failures and its confidence bounds for the next 200 hours. The current time is 410 hours. where Z1-α/2 is the 1-alpha/2 percentile of a standard normal distribution. 1-alpha is the confidence level. Here we use 90% two-sided confidence bounds. Many engineers mistakenly think that these two values are the bounds for the number of failures in the next 200 hours. In fact, they are the bounds for the expected number of failures. In other words, they are the bounds for the mean value of the number of failures. One may therefore ask how to obtain the bounds for the number of failures. This is shown in the following section. As we discussed in Eqn. (4), the number of failures is a random number from a Poisson distribution with a parameter of m(Δt). Using Eqn. (4) and = 8.8185 from Eqn. (5), we can calculate the probability of observing i failures in the interval time of Δt. The results are given in the next table. The first column is the number of failures; the second column is the probability of getting this number of failures; the third column is the cumulative probability of failure. For the 90% two-sided confidence bounds for the number of failures, we can see from the above table that the lower bound is 3 failures and the upper bound is 14 failures. Due to the discrete nature of the Poisson random variable, the lower bound is the largest integer whose cumulative probability is less than 5%; the upper bound is the smallest integer whose cumulative probability is greater than 95%. Table 1 uses , the mean value of the expected number of failures, for the calculation. However, as given in Eqn. (6), there is uncertainty associated with the estimation of the mean value. Eqn. (7) provides the upper and lower bounds for the mean value of the expected number of failures. To get more conservative results, instead of using the mean value, we can use the upper bound of the expected number of failures to calculate the probability of failures. The calculation is similar to the calculation in Table 1. In Table 2, we calculate the probability of failures using . Table 2 shows that the upper and lower bounds for the number of failures are 26 and 11, respectively. 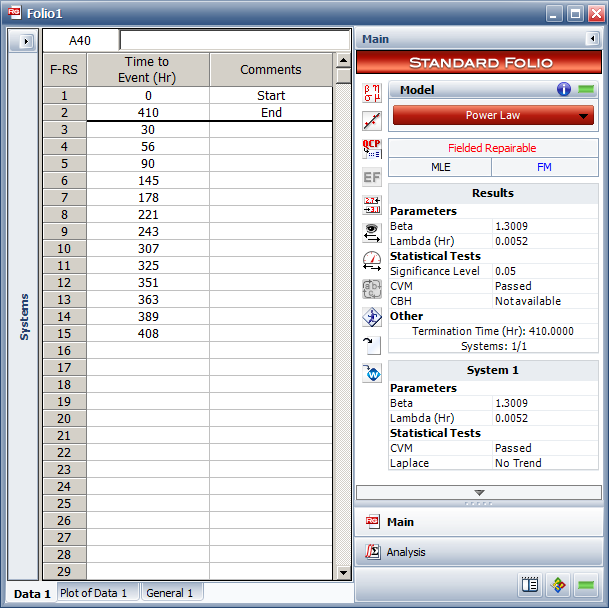 The results in Table 2 can be summarized as: the probability of getting no more than 26 failures is 0.960316 with a confidence level of 95% for the expected number of failures. This is because = 18.61 is the one-sided upper bound for the expected number of failures with a confidence level of 95%. This article explains the differences between the confidence bounds for the expected number of failures and the confidence bounds for the number of failures. The number of failures is a Poisson random variable with its parameters estimated from the data. Due to the limited sample size, the estimated parameter, which is the expected number of failures, has uncertainty associated with it. To calculate the probability of obtaining a certain number of failures, both the uncertainty of the parameter and the uncertainty due to the random Poisson process should be considered. Results in Table 2 include both uncertainties.